Guyana’s Opposition Leader, Bharrat Jagdeo on Thursday warned that the current level of peace would not prevail if the 2020 general and regional elections are rigged resulting in the David Granger-led coalition administration remaining in power. “There will be consequences if they think that they can rig the elections and have the kind of peace that we have now, they’re wrong; very, very wrong. I hope they are not thinking that in their calculation,” Jagdeo told a news conference. His vow came one day after the Chairman of the Guyana Elections Commission (GECOM), Retired Justice James Patterson used his casting vote to appoint Roxanne Myers as Deputy Chief Elections Officer over Vishnu Persaud who had held that office for three years until his contract expired in August 2017. Jagdeo’s People’s Progressive Party plans to file a complaint of racial discrimination against Persaud, an East Indo-Guyanese, to the Ethnic Relations Commission. That party has also appealed a High Court decision that upheld President Granger’s unilateral appointment of Patterson as GECOM Chairman instead of selecting one of Jagdeo’s 18 nominees. The PPP General Secretary believes that the stage is being set to rig the 2020 elections, but he assured that those appointments “will not break our spirit” and his party would continue “fighting aggressively” for free and fair elections. In what appeared to be his clearest signal ever of the political environment that Guyanese could expect in 2020, the former Guyanese leader. “I am making it clear about that and it’s not coded language because then the nature of the struggle will be different. We will be struggling against an illegal, illegitimate government that is not in power through the ballot and it will be a different form of struggle, totally different” he said. Jagdeo dismissed Minister of State, Joseph Harmon’s forecast, as reported in the State-owned Guyana Chronicle, that the PPP would be beaten badly at the next general elections. The Opposition Leader pointed out that this was not in the 1970s and 1980s when government controlled the media, but the People’s National Congress Reform, the biggest party in the governing coalition, would have to face up to the PPP in what is now an “open society”. “There will be an attempt given the nature of the PNC, an attempt to try to tamper with the elections but they are not going to find us sitting down so if Harmon and the others think that we are going to be walk-over, etc, he better disabuse his mind from that notion,” he said. Asked to explain what he meant, Jagdeo challenged Harmon to determine”guess” what he meant, but said if a government comes to power though illegal means, there was no need to abide by acceptable forms of struggle such as peaceful protests and attend Parliament. “If they don’t live by the rules, they come to power without observing by the rules, then the other side should not be bound by any rules because it’s a freedom struggle. It changes from a struggle within an established democracy to one of fighting for freedom,” he said. 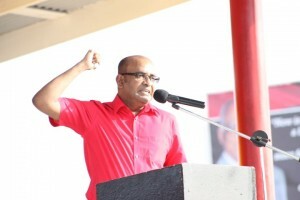 Although the PPP has challenged the 2015 general election result, Jagdeo said the PPP has been treating the government as “legal now and legitimate”. Thief from Thief mek God laugh!!!! Jag is a hothead. What he’s talking about in plain language is war- like street demonstrations that could reach a violent crescendo. We can’t accept this kind of rhetoric in Guyana . We can’t go back to the regrettable past. At the same time, the elections have to be fair and democratic. No tampering- period.